This Web Site is dedicated to collectors of Model/Toy Trains and Department 56 Villages. We feel that the two hobbies are a perfect fit and that Train Collectors and operators have the ideal town and scenery items with Department 56 Villages. These buildings go great with O,O27,S and the new On30 by Bachmann. 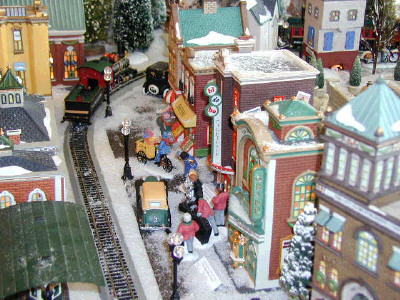 Experience the joys of Christmas all year long with your train layout made up of Department 56 Villages. Toy Trains & Department56 a marriage made in heaven. This site is under construction and please feel free to leave your comments on how to make it a useful site.